If you’ve recently had plumbing issues and the contractor told you that you need pipe rehabilitation, you may be wondering what that is exactly. Well, it isn’t like alcohol or drug rehabilitation, that’s for sure. But it has become highly needed in urban areas where congestion is increasing. The roads are getting busier and there is more demand on the utilities that are in place, including the sewer lines buried under those roads. Trenchless pipe rehabilitation has become popular because it is a cost-effective way to fix existing sewer pipes instead of replacing them. You could look at it as recycling so-to-speak. Pipe rehabilitation dramatically increases a sewer’s life. However, some of the original structure’s integrity is needed, so if the sewer is too old, pipe rehabilitation isn’t possible. 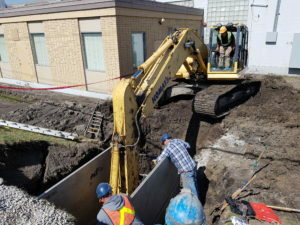 What is pipe rehabilitation is the process of re-lining or slip-lining the pipes with modern fiberglass or, in some cases, they use plastic material. This new lining creates a sewer pipe that resists deterioration from the many chemicals and hydrogen sulfide gas that is found in the sewer. And while the ID is smaller in rehabilitated sewer pipes, the materials used have higher factors of friction that can preserve and even improve flow rates. What makes pipe rehabilitation so popular is that it can be done at the surface in small work areas, even through manholes that are in place already. So disruption to the world is greatly reduced because it is a trenchless method that eliminate the disruption and mess that standard trenching causes. This is great for an established business or resident because that means there is less damage to the gardens and lawn. The cost of pipe rehabilitation is much less than pipe replacement because there is no need to purchase new piping, a huge bonus for anyone that has ever had their business or home re-plumbed!